Successfully Added Wireless Presentation Mouse with Laser Pointer to your Shopping Cart. Experience the newest, most convenient way to use a mouse with the 2.4Ghz Wireless Presentation Mouse! With a unique mini-joystick and plenty of shortcuts and advanced functions, you can finally take full control of your presentation from anywhere in the room! Also includes a built-in laser pointer! Wireless Presentation Mouse: No more sitting at the PC for presentations, no more awkward waiting for your assistant to change slide; you can finally do everything yourself with this Wireless Presentation Mouse, which has a laser pointer, left/middle/right mouse buttons, and so much more! Game Joystick: Play your favorite PC games in a new and unique way! This wireless mouse is great for racing games, shooters, casual games, etc. 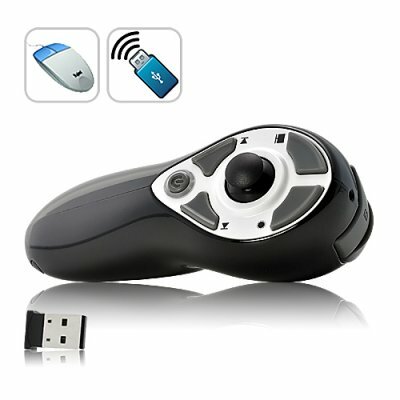 Portable Mouse: Controlling your laptop on the go is made easy with this wireless mouse. Use it in any position you want, in any place you want! Media Player Controller: With advanced functions that allow for volume control, fast forward, rewind, play and pause, you can watch movies from your media player and control everything from the comfort of your couch! With its ergonomic design and many uses and functions, this 2.4Ghz Wireless Presentation Mouse with Laser is guaranteed to be a hit in your online store. Available in our warehouse now, order today and we'll express ship it out tomorrow! Brought to you by Chinavasion, the leader in wholesale electronics and computer accessories. I did not find any CD to install the software drivers? The controller is designed for plug-and-play, there is no additional software needed! If I forget to turn off the controller, will it turn off automatically? Yes, the controller is turned off after 45 minutes of inactivity. If the mini-receiver is unplugged, the controller turns off after 3 minutes.